Fair Play at Gallery Longnecker is an odd grouping of artworks. There are installations which are quite conceptual and there are pieces that are examples of old-fashioned artistic technique. This dichotomy reflects a major dividing line in art for the past 40 years. Of course calling it a dichotomy simplifies the issue. There is plenty of art that straddle these two camps. But in Fair Play the gulf is pretty broad. Postracialism, affirmative action, and immigration reform continue to be major points of contention in the political and social arena. The eight artists represented in Fair Play are a selection of emerging and mid-career Chicano and Mexican artists. They have inherited the social awareness of their forebears, but have realized that the conversation is now much more nuanced. This struck me as a little odd to be happening at this particular moment. Just under a month ago, Adrian Piper pulled her work from Radical Presence: Black Performance in Contemporary Art, which had run at the CAMH initially and is now up at NYU's Grey Art Gallery. Piper wrote in a letter to curator Valerie Cassel Oliver, "Perhaps a more effective way to ‘celebrate [me], [my] work and [my] contributions to not only the art world at large, but also a generation of black artists working in performance,’ might be to curate multi-ethnic exhibitions that give American audiences the rare opportunity to measure directly the groundbreaking achievements of African American artists against those of their peers in ‘the art world at large.’" (This led Hyperallergic to include "Identity Politics Curators" in its tongue-in-cheek annual listing of "The 20 Most Powerless People in the Art World".) It's hard to say if this is a trend, but it does suggest that there are people in the art world who are questioning ethnic identity as an organizing principle for group exhibits. But it's unfair to lay such a heavy burden on this small exhibit. Curator Techang has put together a small group of artists with widely varying practices that you might not normally see in one art space, much less a commercial gallery. I like the incongruous nature of the show. Alex Rubio's painting God of War belongs in the "traditional art skills" category. With its intense reds and oranges and its aggressive imagery, it bubbles with adolescent energy. The image of a tank crossing a desert may remind the viewer of the U.S.'s deadly adventures in Iraq or Afghanistan. God of War is all about being a powerful, overwhelming picture just as, say, David's Death of Murat was. (1) The artist may construct the piece. (3) The piece need not be built. Each being equal and consistent with the intent of artist, the decision as to condition rests with the receiver upon the occasion of receivership. Canales has another piece in the show, Pica Hat. A pica is the lance that a bullfighter uses. This hat is prickly and defensive like a porcupine or a cactus. But the main thing about it in my eye is how cool it looks. The multicolored pinheads on the inside, the silvery penumbra on the outside. This is charge-card art--Canales bought a hat and bought 3000 pins and carefully joined them. But the result is a delightful sculptural object. 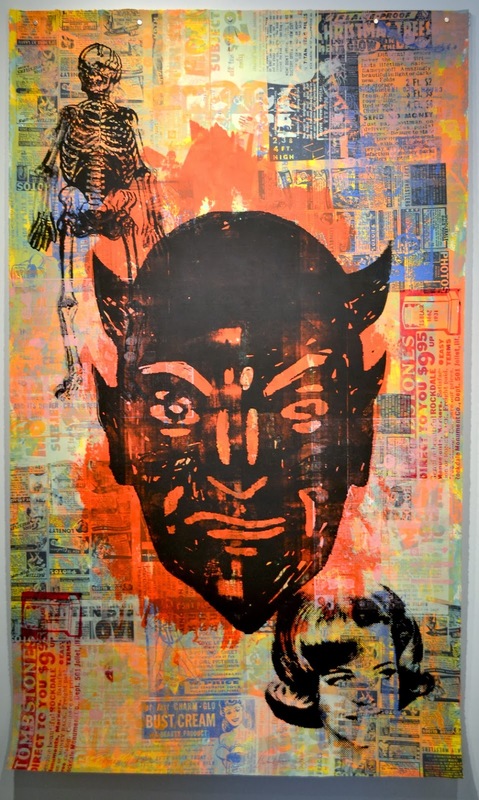 Carlos Hernandez is represented by one of his highly layered silkscreen prints entitled Promise Maker. This work reminds me a little of Faile in the dense layering of imagery. A cartoonish Satan head superimposed of cheesy ads (including one for "bust cream") associates the promises of advertising with the temptations of the devil, which seems a little trite. But the act of interpretation is secondary to the graphic punch this print has. It simply looks great. Adriana Cristina Corral, Within the Ashes, 2013, aerial map of Juarez, Chihuehue, Mexico, with marked sites of found mass graves, ashes from burned paper lists of victims' names marked with red powder pigment. Contrast Promise Maker with Adriana Cristina Corral's Within the Ashes. Promise Maker is right on the surface--it doesn't require that you know anything more than what you see. Within the Ashes, however, is pretty meaningless unless you know the story of its making. You might be able to recognize the map of Juarez, but there's no way you would know it was made of ashes from pieces of paper with the victims of murder unless you read the price price sheet. If you were already familiar with Corral's work, you might guess it was something like this--she has made other artworks dealing with mass violence (particularly with the femicides in Juarez) before. Sometimes we view the conceptual and the traditional, the mental and the optical, the intellectual and the visceral as irreconcilable opposites. While I questioned the premise of this show, it has to be admitted that it allowed Techang the freedom to ignore this division. Finding a way to put such dissimilar artists was Adriana Cristina Corral and Carlos Hernandez in one show is challenging but worth the effort.